[Back from surgery. All went well, thank you. With the re-election of President Obama [Disclosure: I'm unabashedly elated. ], thoughts turn to the Supreme Court. For Court watchers, as well as just about anyone else who follows politics and government, the question of possible Justice retirements and replacements comes to the fore. Four of the Justices are in their 70's. Three will be 80 or older 4 years from now, at the end of the Obama presidency. Those septuagenarians are Justices Ruth Bader Ginsburg, Antonin Scalia, Anthony Kennedy, and Stephen Breyer. Now let's get one thing straight. This is not a death watch. (Others have engaged in that--explicitly.) Nor is this an illness watch. No. My fervent wish is that all the members of the Court would live long and healthy for double their current ages and beyond. So, No. But this is about the reality and history of retirements. Leaving the Court for a host of different reasons. And at different ages. Take, for example, the 3 living retirees. Justice O'Connor left the Court at 75, at least in part to be with her ailing husband. She did so when there just happened to be a Republican President, Bush Jr., to replace her. Justice Souter left at 69, apparently because he never liked--as in really disliked--living in D.C. [This reason is a clarification of what I originally wrote. Thanks to dear friend, J.T.] The country had just elected a liberal President, Obama, who would be replacing him. Justice Stevens retired after he turned 90, thought it was time to go...and there was a liberal President, Obama, to replace him. So there are different reasons, but some common threads. None of these retirees were exactly spring chickens (even though still very vibrant, yes)--although their ages did vary considerably. And each of them did retire when an ideological kindred occupied the White House. 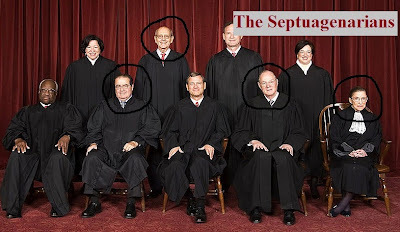 So let's take a look at the oldest Justices still on the Court. Those 4 septuagenarians. If the past is prologue, at least one of them will retire during the coming presidential 4-year term. And liberal Democratic President Obama will be nominating a replacement. Justice Ginsburg is a cancer survivor. Both colon and pancreatic. She'd be 83 by the end of Obama's Presidency. Her record is nearly uniformly liberal. Rights of the accused. Racial and gender equality. Consumer and environmental protection. She certainly would prefer to retire with a liberal President in office who would likely nominate a liberal to replace her. Stated otherwise, she may not wish to risk holding out for another 4 years with the possibility of a Republican winning in 2016. That is, a Republican President who would replace her with a conservative. Antonin Scalia Closest in age to Justice Ginsburg, but furthest in ideology. Justice Scalia, a staunch conservative, has often made clear his hostility--indeed, contempt--for many politically liberal programs, laws, and policies at issue before the Court. He undoubtedly would not want to be replaced by Obama, or by any Democratic President who would appoint a liberal should he retire. So, it's a good bet Scalia will want to hang on at least until the next Republican (or conservative Democrat) is in the White House. If, for whatever reason, he should retire during the next 4 years, the consequences would be profound. Judicially seismic, in fact. Not because Scalia has been particularly influential on the Court. There is little evidence of that. If anything, the indications are the opposite. But a Scalia retirement within the next 4 years would give Obama the opportunity to replace a conservative with a liberal. In doing so, Obama would be doing nothing less than reversing the decades-old ideological balance on the Court. From a conservative majority to a liberal one. Yes, judicially--and likely constitutionally--seismic. For that reason, as long as he's healthy--probably as long as he's warm--Justice Scalia is very unlikely to leave the bench during Obama's next term. In the next post, Part 2 of this series, we'll continue with Justices Kennedy and Breyer.